Following our trip to see the geodes and fluorescent rocks last week at the Houston Museum of Natural Sciences, the Big One chose a Grow Your Own Crystal kit at the museum shop. 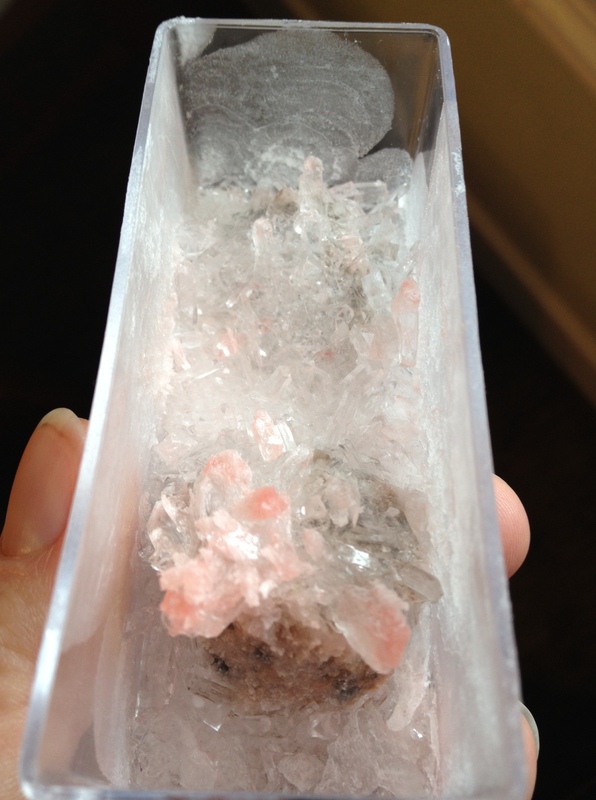 We had grown sugar crystals before but this time we were going to grow rose pink crystals. The box said 10 years and older only but that didn’t stop the Big One from reading all the instructions and supervising me as I mixed the chemicals with the water very carefully. Both girls had a go at mixing the chemicals together until the water had turned pink. We dropped two little stones into the pink water and pushed it to the back of the kitchen counter, to be left for a week. The kit came with a magnifying glass and the Big One checked the growth of the crystals every few hours. After the first day there were some tiny crystals forming and it was very exciting watching them grow day by day. In real life they are very sparkly and pretty. Unfortunately they’ve adhered themselves to the bottom of the small plastic tank we grew them in, otherwise I’d be able to get a better picture and the girls would be able to proudly display them in their bedroom with all their other treasures. Now, how do we grow diamonds?! « Why does our house sound like a caravan when it rains?